Writer. Project Manager. Breakfast Food Junkie. Author of the novel, Finding Sanctuary (Field Order Press, 2017). JHU Alum. Temple Made. When I decided to get off my duff and start my blog, I turned to my dear friend, fellow writer, my Twitter brother, graphic designer and Broadway star Clay Rivers for advice. Clay has his own blog (which is magnificent and a must-read, by the way), so I figured he’d be the ideal person to help me navigate the blogging waters. Clay (Dr. Rivers as I like to call him) created a blog that captured my style and my personality. He did all of the grueling work in WordPress to get it set up for me. Then he told me he had an idea for a custom header. Custom header? Shoot, I was happy to just have a blog. Then one hectic Saturday afternoon, I got a phone call. It was Clay. He had another idea. Considering that I am unashamedly obsessed with breakfast food (hence the “Writer. Teacher. 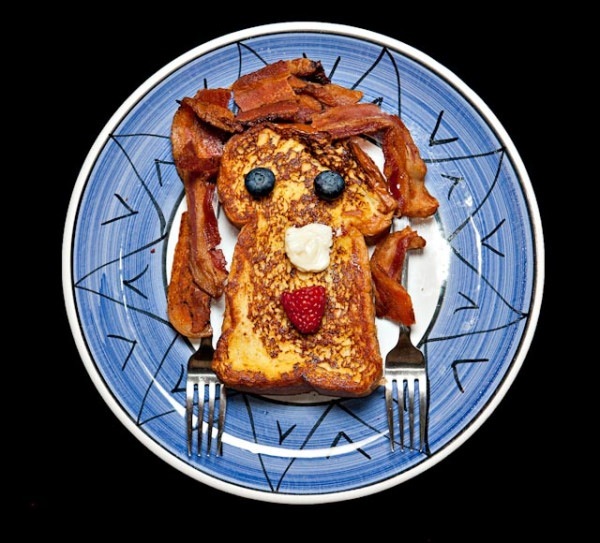 Breakfast Food Maker” tag line), he thought it would be cool to use the header to “set the table” for my blog. He asked me if I was game. Of course I was! It turns out that Clay had a photographer friend in NYC (the fantastically gifted Russ Rowland) who he said could bring this idea to fruition. I trusted that what he would come back with something that would be brilliant. The end result wasn’t just brilliant. It was delicious. And cute! It was perfect. Thank you, Clay & Russ! A few years ago, I stumbled upon an article about a writing workshop for ex-offenders in Baltimore’s City Paper that caught my interest. There was something folksy and raw about this grassroots workshop that brought together experienced writers and those looking to find their voice as they re-entered society. Many of the program’s participants had stories to tell about their lives beyond life behind bars and barbed wire. The name of the workshop — Writing Outside the Fence — seemed fitting. After reading the article, a sense of urgency swept over me. I had to be a part of this effort. My mother instilled the “giving back” mentality in my younger sister and me while we were growing up. As children, we volunteered at church sorting and folding clothes for the needy, or helping out with the church’s soup kitchen. Instead of teaching us to pity the images of the destitute and the homeless on the TV screen, my mom took us out to see what homelessness looked like on the streets of Baltimore. We met orphaned children at a local shelter. We took sandwiches and coffee to men and women living on the city streets, under bridges and in alleyways. I learned a very sobering lesson about life at a very young age. Reading the article about this writing workshop brought back memories of my experience as a literacy tutor at church. It was humbling for me, then in high school, to sit with men and women old enough to be my grandparents and help them learn to recoqnize letters, numbers and simple words. When they were able to read that first sentence aloud on their own, and write sentences for the first time, their sense of pride brought tears to my eyes. I had taken the letters and the words they were struggling to learn for granted. And so, on a muggy afternoon in June of 2007, I headed downtown to Enoch Pratt Library‘s Central Branch for a reading by the participants in the Writing Outside the Fence workshop. I had to meet these people. Both the instructors and the participants were rock stars in my mind. I wanted to be a part of this effort to help those struggling to find and hone their voice. Their writing blew me away. One after the other, they stood up to read powerful, beautifully-written pieces about life, love, loss, hope, darkness, regret, redemption and God. The creative energy in the room gave me a buzz. I wanted to sit in on the next workshop (which is open to the public, by the way). After the reading I introduced myself to the workshop organizer and told her as much. “That’s wonderful, she replied. “But we’re looking for instructors. Would you be interested?” I didn’t feel like I could contribute anything by teaching a workshop. But she asked me to give it a try. I’ve been involved in the Writing Outside the Fence workshops for four years now. It’s been an incredibly rewarding experience. In addition to the weekly writing workshops (held on Tuesday at the Re-Entry Center at Mondawmin Mall), we’ve held several workshops and reading events at the Brock Bridge correctional facility in Jessup. I can look beyond the records and rap sheets and see the stories, the potential and the untapped talent that reside in the hearts of these men and women. Everyone has a story to tell, and no matter who you are, what you’ve done or where you’ve come from, everyone deserves to be heard. Since becoming a part of the WOTF family, I’ve gained a greater appreciation for writing and for the power of words on the page. I’ve probably learned much more than I’ve taught in the past four years. There is a beauty in helping others breathe life into their thoughts and ideas in order unleash their stories waiting to be told. Mark your calendars for September 23-25, the dates for the 16th Annual Baltimore Book Festival! This is one of the premiere literary festivals in the country, featuring many of the best and brightest authors from across the country. I absolutely love the Baltimore Book Festival. It’s held in one of the most beautiful neighborhoods in all of Baltimore: Mount Vernon. The mid-September weather usually is just right, not too hot and not too cool. The lineup for this year’s festival includes: Sherman Alexie, Common, Tananarive Due, Kimberla Lawson Roby, Laura Lippman, Roland Martin, Terry McMillan, Jacquelyn Mitchard, Tavis Smiley, Alice Walker and many more. If you’re interested in being a part of the behind-the-scenes action at this year’s Baltimore Book Festival, you can sign up to volunteer with the Baltimore Office of Promotion & The Arts. For aspiring writers, it’s a great way to get immersed in the literary world (and network with other writers, too). It’s a shame that both the Baltimore Book Festival and the National Book Festival (sponsored by the Library of Congress) are on the same weekend. But if you can manage to make both events, you won’t regret it. However, if you can’t, don’t worry. Several authors, including Terry McMillan and Sherman Alexie, will be appearing at both festivals. 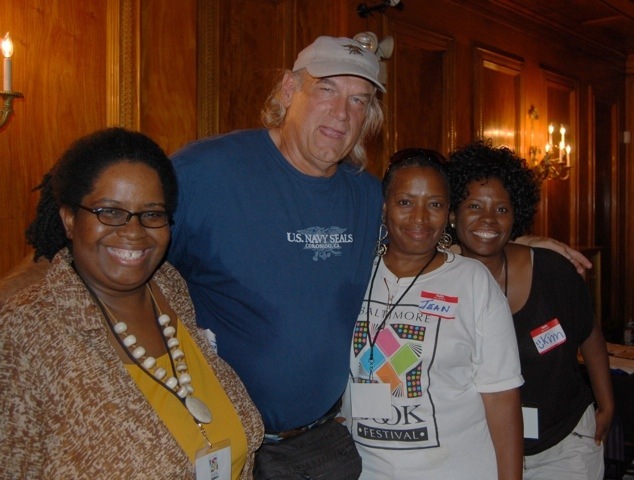 Me and my fellow BOPA volunteers with former Minnesota governor and author Jesse Ventura. Columbus Day 2009. I was just a month into my fourth semester of writing classes as Hopkins, a few days into a new job and I had less than 30 days until my wedding. I was trying my best to stay calm and organized, despite the growing frenzy that was brewing. There was still a lot to do for the wedding. The DIY bride in me was not willing to surrender the creative projects to my very capable wedding planner. Add to that the pressure of landing a new job…a government job where everything had a form and an acronym to boot. On top of all of the real life pressures tugging at me, I had to churn out an endless stream of fresh writing and critiques for my fiction workshop at school. I was able to take an unpolished piece from a previous class, brush it up and submit it for workshop the first time around, but this time, I had to come up with something new. The clock was ticking. I had workshop on Saturday, and I didn’t have a word on the page. With just a few days (literally a few hours) to work with, I wasted no time putting something on the page. I pulled something from recent memory, and started shaping it into a story. I didn’t map it out ahead of time, or create an outline. I just started writing with reckless abandon. Characters just sprung into action. Scenes unfolded as quickly as the words came to mind. I didn’t put much into the piece in terms of consciousness. Looking back on my first draft of the story, I honestly don’t remember writing much of what was there. It just happened. Then I turned the story in for workshop. My classmates had a week to read, re-read and then write a critique of my story detailing their opinions of what was working, what wasn’t and how I could revise it. I was prepared for a lot of comments about a lack of structure, a lack of focus, or about the fact that I wrote the piece in present tense. What was said and what actually happened shocked me. My classmates commented on how intimate and gripping the story was. Someone used the word “organic” to describe the writing. My professor sat at the front of the room, nodding and agreeing with much of what was being said. Then they delved into what needed work. Of course, the story was floundering in places. It was a rough draft. Of course, I had a lot of crying, and dashes of hyperbolic writing in places. I’m an emotional person and it tends to show up in my writing. There were other things that were mentioned as areas of potential improvement, but overall, my classmates like the piece. The funny thing about writing workshops is that the person being workshopped is much like a pedestrian at the corner of a busy intersection watching rush-hour traffic. You have somewhere to go, you’ve got to get across, but you have to wait until the light changes. That’s how I felt watching my classmates dissect my writing, trying to figure out if my story was based on a real event (it was), or if it was part of a larger work (it wasn’t). After class was over, my professor asked me to stay for a few because she needed to talk to me. I was nervous because a few weeks prior she had asked the same thing, but that time it was to admonish me for being late to class two weeks in a row. Commuting from Baltimore to DC even on the weekend was dicey as a bad accident or a DC protest could put the breaks on everything. I wasn’t late this particular week. In fact, I was early. I was nervous and embarrased watching my classmates stream out of the room and into the halls to enjoy the balance of their Saturday afternoon. I was floored, stunned, thinking I knew what she was saying, but then I wasn’t so sure. “I read your story the first time through and was blown away,” she said. Blown away by a first draft? A rough draft? This wasn’t even my best writing. She keenly sensed that I was just framing something on the page and that it wasn’t a part of a larger work (as in a novel or something), but she said, “it needs to be. This belongs in a novel.” She told me my characters — three generations of women coping together through a crisis — resonated with her. She told me my work could go places. She said I was “publishable.” I melted. I’d been called lots of things, but never “publishable” before. After our discussion which seemed to go on for ever, I floated out of the room, onto the elevator and onto the streets of DC. Two large epiphanies unfolded before me that day. I was affirmed as a writer, by a writer, someone who went through the same writing program at Hopkins and went on to get a publishing deal with Random House. I also accepted the fact that the story that spilled onto the page was much bigger than I was willing to see before. The story had been there all the time; in fact, I had been running from it. However, a room full of talented and accomplished writers saw its merit and gave me the push I needed to acknowledge what had been there all along. Artscape is synonymous with summer in Baltimore. It’s the time of the year when people and all things creative converge in the heart of the city’s Arts & Cultural District, when quirky and edgy are normal and square is not. My first and fondest memories of Artscape were when it was in its infancy, just a few years old. My mother put my sister and me in the car on hot Saturday in July and headed into town so we could check out this new free arts festival. I was probably 11 or 12 years old at the time. Life for me was about Michael Jackson and Prince and MTV and the Rubik’s Cube. The 80s were bright and big. Shoulder pads were in. So was the Jheri Curl. As a child of the era, I was subjected to both. However, it was during that decade that I learned to appreciate creativity in all its glory. Looking at all of the outdoor art exhibits at Artscape, I marveled at the wild, quirky artwork on display. I remember seeing painted toilets, newspaper and foil fashioned into art, and many other unthinkable things. Nothing inappropriate, just strange. I embraced Artscape. It was a big playground for the creative types. Individuality and expression were celebrated. People sang, danced, ate, and danced some more. 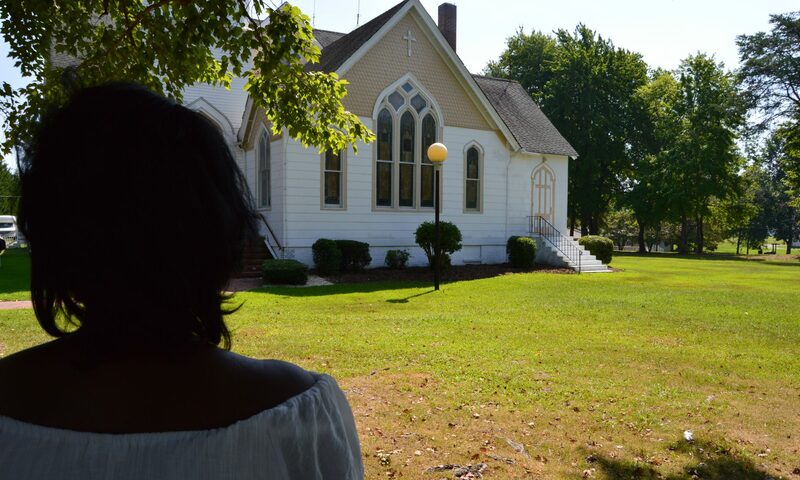 My mom, my sister and I walked around that first year and took it all in. Artscape became an annual tradition. This year, Artscape turns 30. To mark the occasion, Artscape are going retro. 1982 to be exact. There plenty of beats and eats to take in this weekend. Add to that karaoke and improv comedy and storytelling workshops, and shows paying homage to pop culture (Think: all the 80s toys and fashion your nostalgic heart can hold). I was supposed to meet BroLightEyes at Tyson’s Corner one evening after work for an early dinner and a movie. We had chatted on the phone a few times, and I immediately was drawn to him because of his smooth, baritone voice. In his online photo, BroLightEyes had captivatingly hazel eyes and a great smile. I could not wait to meet him. On that fateful day, I drove to Tyson’s Corner, parked the car strategically facing the incoming traffic and primped in the mirror while I waited. I was dressed to impress, well-coiffed hair, lip gloss gleaming. BroLightEyes wouldn’t be able to resist me. I sensed disaster when I spotted a beat-up white car sputtering around the corner. My heart sank. It was BroLightEyes. How did I know? Those hazel eyes were blazing. He was studying me as if I was his prey. BroLightEyes parked his car and got out, and as he approached, he chucked a hocking wad of spit across the parking lot. Everything I thought was attractive about him dissipated. He had on a brown leather bomber jacket, and a dull brown shirt-and-tie ensemble. It was 90 degrees outside! He adjusted his hanging work badge around his neck just so that I was able to see that BroLightEyes was Mel Jones, Jr., a Network Security contractor with Lockheed Martin. I supposed he expected that would turn me on. As I watched him shuffle towards my car, my hopes for the date evaporated in the warm, late spring air. Mel seemed much older and wearier than he appeared in his pictures online, about a decade or two older than what he had put in his profile. He walked like “old Arthur” was getting the best of him, yet he was trying to strut like he was some hip cat from the 70s. Totally deflated yet compelled to go through with the date, I trudged along as Mel wandered through department stores looking for furniture for his new apartment. “It’s been a long time coming,” Mel warbled along with Sam Cooke whose voice floated from the store speakers. I could tell by Mel’s stupid grin and his winking eye, it was going to be a long time going. During our aimless walk through Tyson’s Corner, Mel made several attempts to grab my hand. My mother taught me never to hold hands with strangers. And so I didn’t. While I was silently suffering, Mel was happy to have a companion he could drone on to about the ex-wife, the son she won’t let him see, the roommate with the vomit-spewing cat, the arthritic knee and persistent back pain, eye problems, knee problems, the on-again-off-again love affair with cigarettes, and a whole lot of other stuff I wasn’t listening to. Then he pumped his fist in the air with an awkwardness and utter lack of coordination that made me want to hide myself in the clearance bin. Mel, who looked like he was old enough to have had a couple of his “very own apartments” already, didn’t have his own place? Never had his own place? Mel grinned sheepishly and tried to tell me in his deep Mr. Smooth voice that he never had his own apartment. He sounded like Mr. Magoo. “How old are you?” I blurted out, not caring what he thought of me asking such a question right behind his overdue declaration of independence. I already figured it out, Mel, I thought. The good angel on my left shoulder was trying to tell me that Mel was just a year or two older than his profile stated. But the bad angel, who had become my best friend over the past hour, bet the good angel that Mel was much older than that. My money was with the bad angel. The bad one was right. Mel’s profile claimed he was 36. The joker admitted to being 49. Now, there’s nothing wrong with being 49. It’s a great age. But not for Mel. He actually could pass for much older. As he talked and gestured, the big, dangling gold earring from his left ear bothered me. No man with the amount of gray hair that Mel had should be allowed to wear an earring that big or a leather bomber jacket in 80-degree weather. “So did you want to grab some dinner?” Mel asked, gesturing towards The Cheesecake Factory. That was the first question he asked me the entire time we were together. The Cheesecake Factory would have been a wonderful place to go for dinner with a date, but just not this date. Besides, it was Wednesday, Results Night on “American Idol.” Simon needed me. America needed me. And that became my perfect excuse to escape. On the drive back to Baltimore, I reflected on my streak of bad luck with men I’ve met online and restaurants. There was a pattern here, a dangerous one. Now MrBrandMan2U had a slightly skewed view of the world. He considered Horn & Horn and Red Lobster to be “upscale restaurants.” When he went out to for dinner, he brought his own special blend of Old Bay Seasoning and crushed Cayenne Peppers to restaurants and would send a little container in the back for the cook to season his crab legs with. He was so well-known throughout the restaurants in the area for being a BYOS (Bring Your Own Seasoning) patron, that they usually accommodated him. I realized for sure that this cat wasn’t the one when he took me to a breakfast restaurant: Happy Family Restaurant. The name was a misnomer. Nothing was happy about that dump. It was a bland, blah-looking eatery, its style harkened back to the days of Howard Johnson and your local diner trapped in the 70s. Our server’s name was Velma, typical server name, I’d guess. She was a plump, surly-looking woman stuffed in an old-school pink waitress uniform complete with the frilly lace ruffles. She snarled at us as a form of welcoming us, and took our orders. MrBrandMan2U was giddy. “This is going to be so much fun,” he chirped. He asked for his milk to come out with his breakfast platter. Velma replied, “Oh you’re one of those types, huh?” Then she rolled her eyes and sauntered up to the counter. Stunned, I asked him if he thought she was being rude. Apparently, he didn’t. “It’s part of the gimmick,” he said bouncing in his seat like a 4-year-old. When our food came out, she slammed our plates on the table. “Excuse me, you forgot our syrup,” MrBrandMan2U giggled like a third-grader. “Go up to the counter and get it your damn self,” Velma barked, and walked off in a huff. Then Velma came stomping back to collect the tip from the people at the next table who seemed to enjoy being insulted as much as my date did. “You forgot my milk,” he was on the edge of his seat waiting to be insulted. I don’t think I’ve ever seen anything like it in my life. Velma put one hand on the table and the other on her hip, and assumed the I-Am-Black-Woman-Hear-Me-Roar stance. MrBrandMan2U bounced and ate as the sound of rude waitresses insulting patrons ricocheted off the walls. He later said that was the best date he ever had at the Happy Family Restaurant. And not because of me. But because Velma cursed him out. And he left her a tip! DISCLAIMER: All names have been changed to protect the identities of persons mentioned. No animals have been harmed in the writing of this piece. Furthermore, this essay does not reflect the views or opinions of anyone other than me. Do not try this at home. Or anywhere else. Ever. I mean it. Every time I see the eHarmony commercial featuring Neil Clark Warren and those sappily-ever-after eHarmonized couples, I have flashbacks to my own dramatic experiences with online dating. I made the foray into online dating about three years ago after a string of unsuccessful relationships. I lamented about my dreary state of singleness to anyone who would listen. I had painted such a sad picture for myself. I would be single forever while the rest of the world would bask in a lifetime of marital bliss. It just isn’t fair, I whined to Stephanie, one of my happily coupled-up girlfriends one rainy Saturday. After having endured several of my dramatic, well-rehearsed soliloquies, she stopped me. I met Warren, Satan’s first cousin, on a site I like to call Scratch.com. His profile stated that he was a hard-working brother with an executive job in sales, and a beautiful townhome in Northern Virginia. It also said that Warren enjoyed traveling, sports and hunting. In reality, Warren was a lazy copier salesman hanging onto his cushy job by a thread. And the stately townhome in a swanky Northern Virginia neighborhood was about to go into foreclosure because his ex-fiancée had had enough of his wandering eye (a hobby he forgot to mention). When I met him, I saw a tall, chocolate brother who looked more attractive in person than he did in his online photo. After a few short months of dating, Warren, the polished, smooth-talking, attentive gentleman who obsessed over fine suits, ties and crisp creases in his dress slacks, turned into a sadistic Class-A jerk that had a woman for every day of the week. Warren’s horrible behavior and inconsistent lies had me sprawled out on my friend’s couch crying over my broken heart. So for Stephanie to suggest I venture back into cyberspace on another quest for love was ludicrous. Stephanie, a self-professed online dating expert, offered to tweak my online profile to help me get more hits from potential suitors. After all, she had just met a great guy herself on the internet, and she was still racking up winks, nods and online kisses. Stephanie’s edits ended up being edited by my friend Marissa, a dating expert in her own right. Wild and brazen, Marissa wasted no time in marking up my profile with drastic and racy changes. My new and improved profile ended up being a hybrid of Stephanie’s distinguished edits and Marissa’s tawdry suggestions. The first day the new and improved Mocha1Mocha appeared online, she got over 100 hits. I was delighted. I hastily scribbled down the user names of the cute gentlemen I wanted to respond to: MillionaireBy40, BroLightEyes, MrBrandMan2U, SuaveRev007. Eager to erase the memories of Warren from my mind, I started firing off responses to my admirers. MillionaireBy40 was the first to respond. His real name was Ray. He lived in Baltimore. He was 41, and not a millionaire. Ray was an entrepreneur with big dreams and lots of dumb ideas. His goal was to get rich selling “liquid nutritional products” through his internet-marketing website. He claimed he also had a side business as an independent contractor, for some lucrative business on the verge of big profits. Doing what, you ask? Hell if I ever found out. The only real clue I had was that Ray said his workday normally started around two in the afternoon. By then, half the day was gone. Ray wondered why his business was so slow. I guessed he assumed that the average person didn’t start working until late in the afternoon, and that banks, merchants, vendors and hospitals opened at two in the afternoon. Just as frightening images of me being the wife of a liquid-nutritional-product-hocking-slash-independent-contractor-of-nothing flashed before my eyes, Ray said he had just read the book The Secret. After reading the book, he wrote himself a $10,000 check and taped it to his bathroom mirror. I wondered why he just didn’t write himself a check for a million dollars. After all, he was MillionaireBy40, and according to his age, he was slightly behind schedule. Ray insisted that the positive energy of wealth was flowing through him. But apparently, it wasn’t flowing strong enough to keep his gas, electricity or telephone on. It seems that MillionaireBy40 was in the middle of billing disputes with the utility companies at the time. I only found this out when I asked about this Jesse Anderson person whose name appeared on my caller-ID screen whenever Ray called. When he attempted to offer an explanation, he stammered “see, what had happened was…” the first five words in a chronic liar’s vernacular. It turns out that Jesse Anderson was Ray’s good friend who had good credit. I saw no future with the liquid nutritional product marketing executive slash part-time independent contractor of nothing who couldn’t get a line of credit with BGE or Verizon, and crossed him off the list. SuaveRev007 called me one rainy evening to ask me out on a date. During the conversation, he seemed like a great guy, decent conversationalist, well mannered. I was kind of touched when he offered to pray before ending our phone call. The first date — at a outdoor concert on the Sunday before Labor Day – was rather uneventful save for a trip to his office in Warrentown where he wanted me to check out the lobby and the restrooms. I think he was more concerned about me being impressed that he had a key to his office building. Wow. Then another Sunday (all of our dates were on Sundays, it seemed) I accompanied him to a guest-preaching gig at a friend’s church. Before he began his sermon (which was about a dry as the Mojave Desert), he took a moment to acknowledge me – his girlfriend – Michelle for coming out to support him. I wanted to raise my hand and tell him, “Excuse me, but my name is Kim.” But I didn’t. And there was another Sunday…the Sunday I’d like to call Salad Bowl Sunday. We visited a big, vibrant church, and the singing was so good, I felt compelled to put a little extra in the offering plate when it came around. “God loves a cheerful giver”, that’s what the Bible says. God loves babies and fools, too.